Almost a year ago our post on the hipster headdress gained some attention. Since then, we've kept our eyes on the blog, Native Appropriations, to follow and support the conversations on the appropriation and continued disrespect of Native American culture in the US. 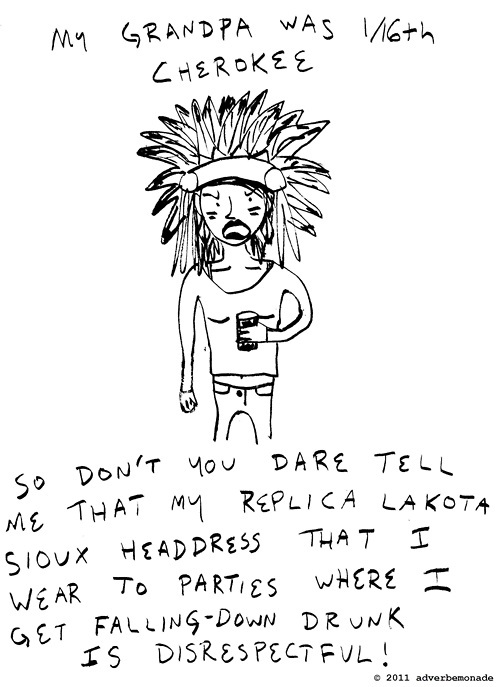 With the summer festival season on the horizon, it should be interesting to see if the hipster trend of wearing Native-themed costumes continues, and what response, if any, will result. Adrienne, over at N.A., refers her readers to this wiki page on cultural appropriation, but we encourage you to look through her site (and the comments!) for a revealing look into the effects of and reactions to cultural appropriation. It's clear, that in the US at least, people all too easily forget that Native American culture is not only alive, but continues to thrive. As for the activist-themed drawing above, we'd like to thank Native Appropriations for the link, and also give credit where credit is due. Lydia over at Adverbemonade posts her drawings almost daily. Many of them will make you giggle, and some, like the one above, will make you think. Labels: art, indigenous issues, politics, U.S. Sadly, this type of appropriation isn't limited to just kids wearing headdresses to shows. It's also been quite popular with hipster art too.